Perhaps you’ve been noticing some subtle changes in Mom lately; nothing significant that you can exactly put your finger on, but she seems a bit more frail, or maybe a bit more forgetful. You’re concerned about her being home alone so much; what if she falls? Or leaves a pot of soup cooking on the stove and forgets about it? And wouldn’t it be great if she had someone to talk throughout the day? It may be time to consider the services of an in-home senior caregiver to ensure Mom remains safe at home. But, where do you begin? Cost. It may seem like a no-brainer that choosing an independent caregiver from the paper at a very low hourly rate is the most cost-effective, but there are a number of hidden costs that you or the senior will be responsible for: payroll taxes, worker’s compensation, liability in the event the caregiver is injured at the senior’s home. Hiring a caregiver through a professional home care agency, such as Compassionate Nursing Services, ensures that all required taxes and potential insurance issues are covered for you. Safety. How much do you really know about that caregiver you’ve met through a newspaper or online ad? Caregivers hired through Compassionate Nursing Services and other reputable home care agencies have been background checked, drug tested, and fully screened to ensure safety and peace of mind. Additionally, many don’t realize that if an independently hired caregiver is injured while caring for your loved one, you may be liable for any medical bills or workers’ compensation coverage. Our caregivers are employed by our agency and fully insured and bonded, which means you are protected from any liabilities. Reliability. What happens when an independent caregiver needs time off for a vacation or sickness? Or, suddenly decides to pack up and move to Tuscaloosa? Will you have a backup plan in place for Mom’s care? 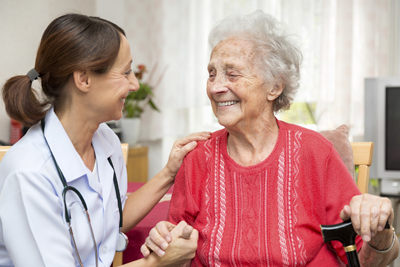 Home care agencies, like Compassionate Nursing Services, have a pool of fully trained and experienced caregivers standing by and ready to seamlessly step in when a senior’s regular caregiver is unable to work a scheduled shift. Making the decision to trust the care of your senior loved one to an in-home caregiver is one of the most important decisions you’ll make, and one that should definitely not be taken lightly. When researching your in-home senior care options, we invite you to contact Compassionate Nursing Services. We’ll be glad to meet with you and answer any questions you may have, and will even provide a free in-home assessment to let you know how we can best help your senior loved one remain safe, comfortable and happy at home. Give us a call at 314-432-4312 to learn more.